Glamorgan have rung the changes for their County Championship game against Kent in Cardiff after seeing their promotion chances ended. Jeremy Lawlor makes his senior debut, while Aneurin Donald, 18, is back from England Under-19 duty. James Kettleborough returns to the squad for the first time since May. Vice-captain and previous skipper Mark Wallace will lead the side against Kent and Northants with Jacques Rudolph on paternity leave. But spinner Kieran Bull and seamer Ruaidhri Smith will miss the remaining three games because of injury. Coach Toby Radford said the cause of Bull's stress fracture to his back was a mystery. He said: "It'll take a couple of months to get it sorted with rest and our medical staff assessing how it happened and how he goes forward. "He's a high-quality young spinner and it's very rare for a spin bowler to get a fracture so we're trying to get to the bottom of it." 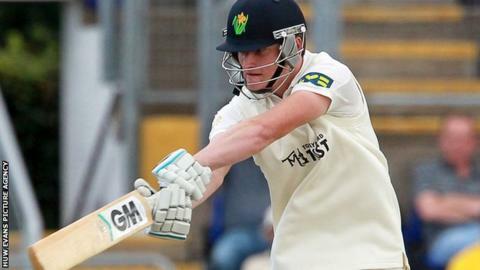 Glamorgan can finish no higher than third in Division Two after Lancashire and Surrey secured their promotion places in the last round of games. The Welsh county have slipped to fifth in the table but have a game in hand on Northants and Gloucestershire. But head coach Toby Radford does not believe his players will be short of motivation. "There's personal pride and we want to be in the top three or four at the end of the season because that was one of the goals we set," he said. "As much as we want promotion, it isn't going to happen this year so we're on a path of development for the club, while individual players want extensions on contracts."